One of the most important skills we need to learn as leaders is how to balance things effectively. 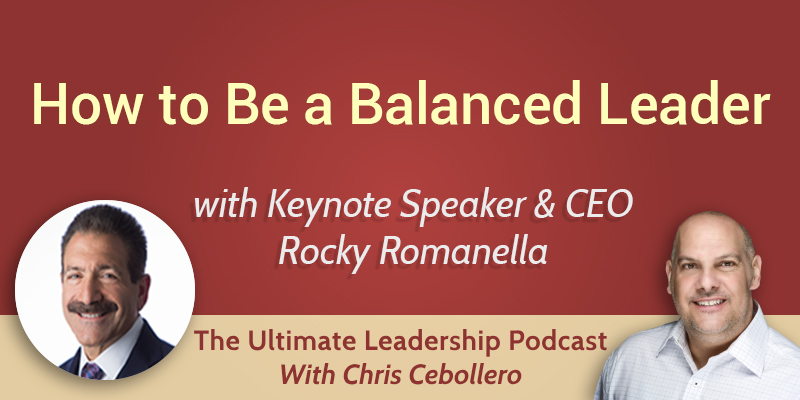 This week I have the perfect guest to help us with that: keynote speaker and author Rocky Romanella. Rocky believes that we’re all leaders. Sometimes we can get caught up in titles, but at the end of the day we’re all leaders at one time or another. For him, leadership is leaving things a little better than you’ve found them. Are people better after they’ve interacted with you? Then you’re a leader. Rocky noticed that great leaders always keep things in balance. Extremes are generally no good on either side. So how do you find this balance? When you swing one way too far as a company or a leader, you get out of balance. Rocky began to develop the concept of balanced leadership. Am I thinking like a customer? Will my people understand the role that they play and why we’re doing what we’re doing? Am I acting like an owner? Great leaders understand how to accept and handle bad news, they know when to apologize and when to move forward. As a leader, you have to believe in your people many times until they’re ready to believe in themselves. For Rocky, leadership is ultimately about legacy. Things are better because of you and people will remember you for the good things you’ve left behind.